ABOUT .... . ....... .CONTACT. ... ..........ARTICLES........ .. ... .SEARCH ...... ...... ..LINKS... .. . ... . follow on twitter. The New City is a web journal about urban development, arguing that cities should be prised from the control of bureaucratic planners and left to a suburban market of workers, families and businesses. Based in Sydney. Click here for our free email updates. "In my view, the most important feature of postwar ... development has been the almost simultaneous decentralization of housing, industry, specialized services, and office jobs; the consequent breakaway of the urban periphery from a central city it no longer needs; and the creation of a decentralized environment that nevertheless possesses all the economic and technological dynamism we associate with the city. This phenomenon, as remarkable as it is unique, is not suburbanization but a new city." 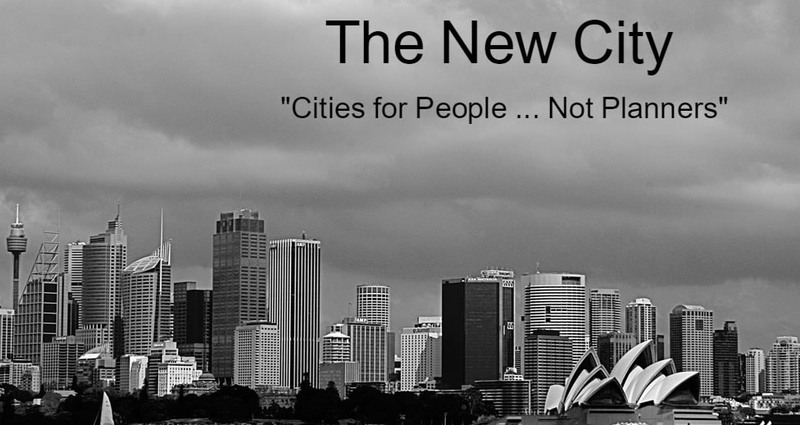 The New City has been called "Labor’s New Right fifth column online", "mercenary swine", a journal "paid for, and run by, the Liberal Party", "intellectual servants of the powerful", and "a bizarre website mixing climate change denialism with cheerleading for urban development, all united by an odd workerist rhetoric". In fact, we believe inner-city elites have turned their backs on ordinary working people: the 70 per cent of the workforce who hold blue-collar and routine white-collar ‘jobs’, as distinct from the 30 per cent who enjoy professional ‘careers’. If politics is about idealism rather than self-interest, so-called "progressives" should be speaking out for the interests and priorities of workers who are spatially concentrated in the growing outer suburbs. Chanting fashionable green slogans, few of them understand or care about the new city. Their green-compact-city ideology caters for the new professional classes, while blocking the social mobility of almost everyone else. The effects are adverse for broad-based economic growth, employment dispersion, housing affordability, home ownership, transport efficiency and a host of other urban challenges. The New City argues these objectives are best approached from the perspective of market suburbanism. Cities should be prised from the hands of bureaucratic planners and left to a free market of workers, families and businesses. More than a decade has passed since we assisted Michael Thompson in writing his ground-breaking book Labor without class: the gentrification of the ALP (Pluto Press, 1999). While Michael was subjected to vilification from guardians of the progressive party line, his warnings about the Left's wrong turn were vindicated. So were those of former finance minister Peter Walsh, one of the great figures of Australian public life. Peter was uncompromising in demanding that government action should produce real benefits for workers and their families, rather than progressive elites. The New City aims to carry this ideal into Australia’s ongoing urban and social debates. Copyright© 2018, The New City. All rights reserved.